Cloud9 Receives Sleeter's Awesome Application Award! Cloud9’s virtual server solution was named #1 in a prestigious annual accounting technology polling! Cloud9 Real Time was selected as one of one of the 2013 Awesome Applications by The Sleeter Group for its Virtual Server Solution. 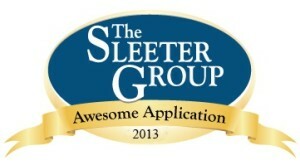 With thousands of accounting and management programs on the market for small businesses, the Sleeter Awesome Applications Award signifies that Cloud9 is among the most productive and effective technology providers in the accounting industry, and that it meets the highest standards of design, ease-of-use, and conformance to critical accounting standards. Cloud9 Real Time’s Virtual Server Solution provides accounting firms with a total Cloud solution, replacing the need for an in-house server – hosting all of the applications, data and users in one central location plus the added benefits of Microsoft Exchange services. Transitioning from the traditional client-server infrastructure to a hosted virtual server solution allows firms to save thousands on IT expenses including hardware, licensing and consultant fees. Cloud9 Real Time President/CEO, Robert J. Chandler was honored by the award, “The Sleeter Awesome App award is a great accomplishment for any ASP. Our continued technology advancements over the last year have been tremendous and it is a great recognition to our team for all their hard work and dedication.” Mr. Chandler himself is an educator and advocate for Cloud technologies in the Accounting Profession – Chandler’s recent book, Together in the Cloud, provides a how-to guide for business owners and a reference point on implementation of next-generation virtual office solutions. The Awesome App Awards were formally announced today at the 2012 Sleeter Accounting Solutions Conference in Anaheim, CA. The annual event draws hundreds of accountants, bookkeepers, consultants and IT professionals, providing educational opportunities presented by industry experts, thought leaders and technology developers. The Sleeter Group (www.sleeter.com) is the largest network of small business accounting technology and business process design consultants in North America, serving over 300,000 small businesses and professional practices. The Group provides accounting software training resources to users and consultants including textbooks, reference books, expert level Webinars, the annual Accounting Solutions Conference, a consultant membership network, practice management tools, teaching systems, and a free online newsletter. Cloud9 Real Time is an Accredited Managed Service Provider and Licensed Commercial Host by Intuit and Sage in the US and Canada; Offering a customized and privately labeled all-in-one virtual office portal. With advanced hosting solutions you can have 24/7 access to all of your applications, Microsoft Office, Exchange services and data in one central location. On the forefront of cloud computing, Cloud9 Real Time offers QuickBooks hosting as well as custom virtual server creation.